Not long after purchasing vineyards in the late 1960s and releasing his first wines in the early 1970s Jacques Seysses became an international icon. His ability to coax the utmost flavor and texture from his grapes set him apart from his Burgundian brethren. Jacques respect for the terroir of the Côte d'Or is still on display in his viticultural practices and innovative winemaking methods. 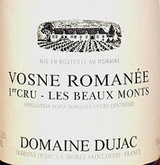 Dujac wines are more than just varietally correct - they are intimate travelogues of some of the most celebrated sites on earth.